Since I discovered Magica Voxel of Ephtracy, a brand new real world has unfolded before my eyes in terms of ideas and designs. I've been able to not only work with voxels, but also in the 3D printing world (I'm developing a line of toys), but mainly for games. Magica is an extremely powerful software and very simple to use. 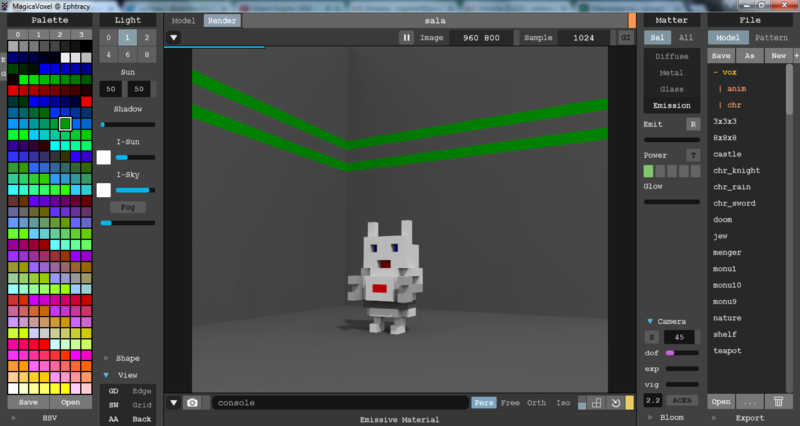 It is free and can be used in several projects (if you want to help in a project... click here) and it has a powerful renderer mechanism that I have rarely seen in software like that. I'm using Magica to create assets for my games (I really like the style and the retro feeling) for commercial use for developers, and game art. This article will show some simple and very powerful rendering techniques in the application so that you can use them in our your games or even on the creation of concept arts. I start from the assumption that you already have a basic knowledge of editing in Magica and that your rendering experience is very primary. I will apply here some very simple techniques in a series of 3 articles for you. I'll show you how to create a room with some pretty cool tricks. 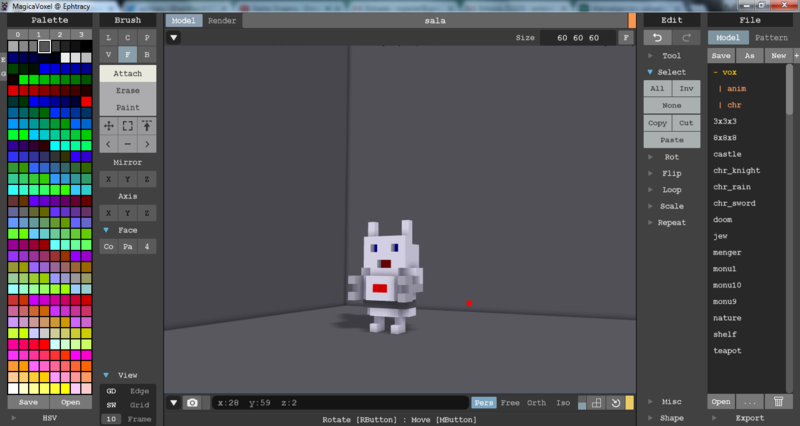 Initially, I did a simple scenario with the little Roboto, a character from my game. I will now zoom in the camera and choose a more closed up view. If you press the Render button, it will not change at all. However with the selected green tone, open the Emission material, with the SEL option pressed. This allows you to select only the color chosen to apply the material. Start to change the parameters as you can see in the example below. Change the values of Emit, Power, and Glow. Pretty interesting, huh? But let's not stop there. Let's now work with Bloom. 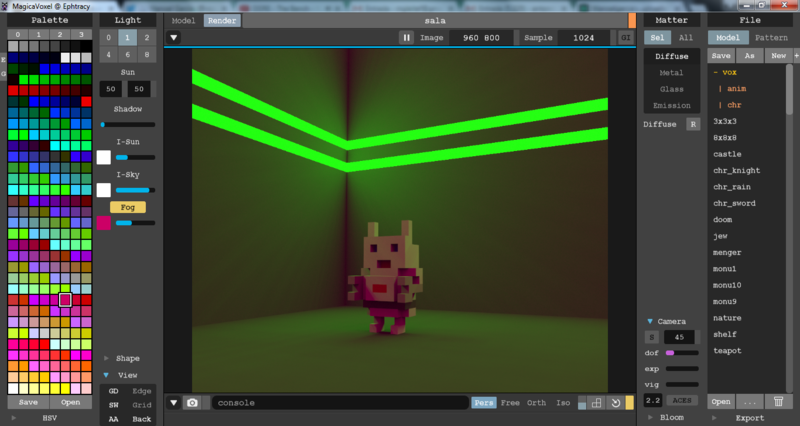 The Bloom parameter allows our effects like glow to emerge in our scene. When you start rendering, press the Bloom button and see the changes. 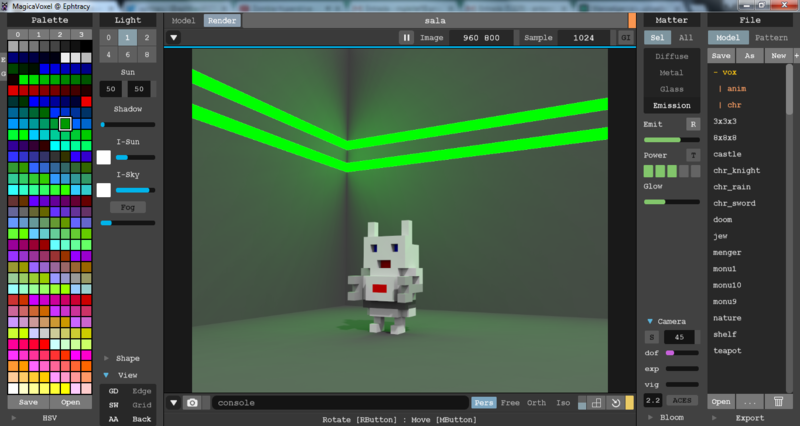 If you select the color green, used to paint the wall and decrease the Power option at the time of rendering, when applying Bloom, you will have a more interesting result. By changing the Fog, Power, Glow, and Emit parameters we can have some very interesting effects. I'll change the vig (Vignette) value to get a slightly dark scene lighting and apply Bloom again. Finally, I will activate the red light of the torso panel of Roboto by selecting it in the editor and applying the rendering emissive material. Our scenario is finished quickly and simply. Before applying the material, have the correct color selected. The color selected will be the color that will receive the material. 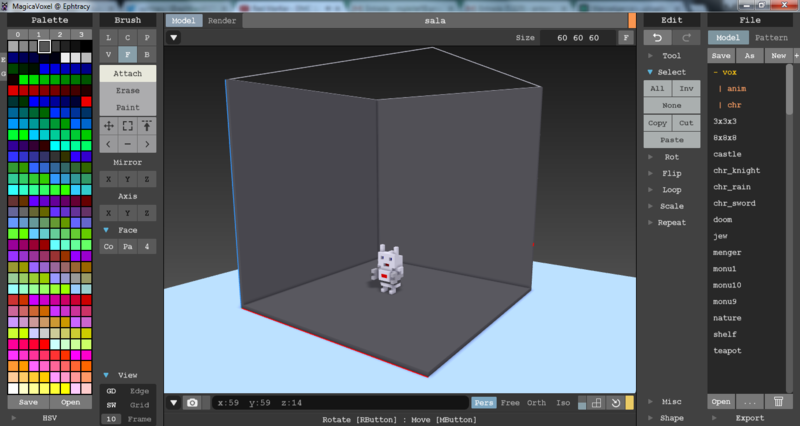 If you want to deactivate the material ownership, press the R (reset) button on the material type. If you want to apply the Bloom effect, you need to press it when restarting a render. This is the first article in a series. I hope you have enjoyed it and that it is useful for your work. For any questions, please send me a message or post a comment on this article. I find it very cool to exchange ideas with developers and other artists. Magicavoxel has a really nice rendering feature such as metallic or water/glass but for now I don’t know how to export those materials into a game engine like Unity 🙁 Do you have any advice? Do we have to re-create them with Unity’s tools. Thanks in advance!